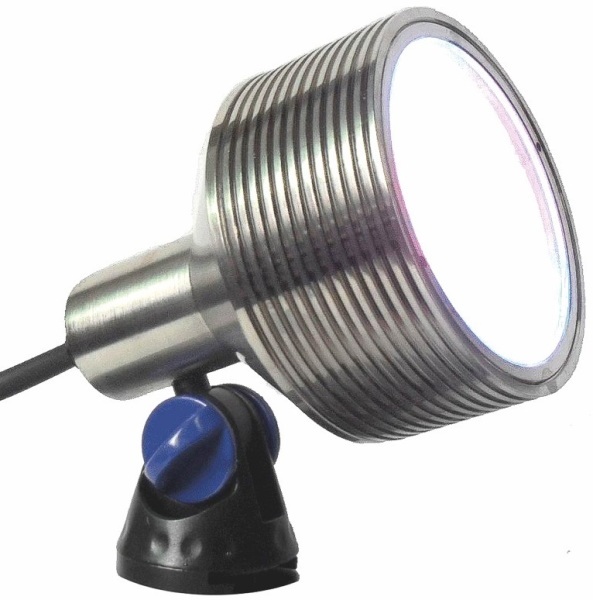 The UltraLuxx is a high output, low energy 12 volt LED spotlight for outdoor and underwater installation. The UltraLuxx spotlight emits a warm white light beam at 750 lumens (equivalent to 75w halogen) whilst using only 18 watts. The large light face allows widespread illumination with a beam angle of 30 degrees. The light source is made up of 9 x CREE 3000K (warm white) 2 watt LEDs and this complete fitting is contained within a nickel-plated brass spot light housing and clear glass lens. The plug & play power lead is 5 metres long. The UltraLuxx LED is rated IP68 full permanent underwater installation and can be submersed in water down to a depth of 2 metres. The UltraLuxx light features a knuckle joint at the base which can be connected to variety of mounting accessories which are supplied separately. All mounting accessories will allow the light head direction and angle to be set. Available mounting accessories for the UltraLuxx LED include a Mounting Base for stable free-standing, a Ground Spike for staking and a Wall Clip for wall and hard surface securing. The optional Anti-Glare Shield can be used to direct light transference and cut out direct beam exposure. The UltraLuxx LED requires a suitable Transformer (Not Supplied) and is compatible with all plug & play low voltage Cable & Control Accessories.